Organisers of the 2015 Bluff Oyster and Food Festival are labelling it one of the “best we’ve ever had”, with an outpouring of praise for the festival’s new home. An estimated 4000 people enjoyed seafood, sounds and snippets of sunshine on Saturday during Bluff’s biggest annual event. Despite a chilly wind and intermittent rain showers, there were pockets of sunshine and the clouds drifted away by about 3pm. Bluff publicity and promotions officer Lindsay Beer said he had received excellent feedback, and the new purpose-built venue was brilliant. It was not yet known how much money had been made from ticket sales, but a countup was likely this week, he said. Stallholders and festival-goers alike had high praise for the venue, which was necessary after last year’s festival was shut down in gale-force winds, he said. Bluff Oyster and Food Festival committee chairman John Edminstin said the crowd was an incredibly happy one. As always, the oyster opening competition was a highlight of the day, with hundreds gathering in one of the new structures to watch. Shane Wixon of Ngai Tahu Fisheries won the men’s oyster opening competition in a time of 2 min 38sec. Defending champion Jimmy Ryan-Thoms, who complained of a bent knife in the first heat, was fourth. Wixon also took out the title of fastest oyster-opener while blindfolded. Defending champion Victoria Pearsey, of Barnes Wild Bluff Oysters, won her fifth straight title in the women’s section with a time of 3min, just 2sec quicker than runner-up Peg Bishop of Direct Fish. A tiebreaker was required in the oyster-opening factory relay when Team Direct Fish and Team Barnes tied with a time of 4min 49sec. Team Direct Fish came out on top, winning the tiebreaker by 5sec. 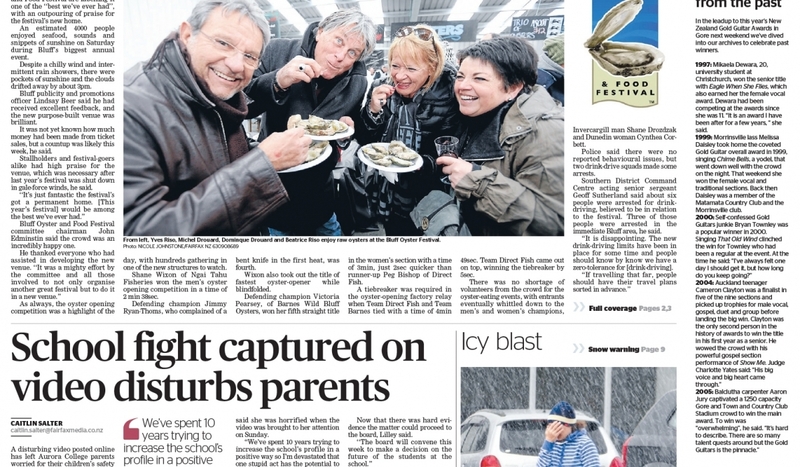 There was no shortage of volunteers from the crowd for the oyster-eating events, with entrants eventually whittled down to the men’s and women’s champions, Invercargill man Shane Drozdzak and Dunedin woman Cynthea Corbett. Police said there were no reported behavioural issues, but two drink-drive squads made some arrests. Southern District Command Centre acting senior sergeant Geoff Sutherland said about six people were arrested for drink- driving, believed to be in relation to the festival. Three of those people were arrested in the immediate Bluff area, he said. “It is disappointing. The new drink-driving limits have been in place for some time and people should know by know we have a zero-tolerance for [drink-driving].